Create Bake Make's delicious Tim Tam cake can be made in just one bowl – but you may need an extra packet of Tim Tams for snacking on the side, because those bikkies are delish! 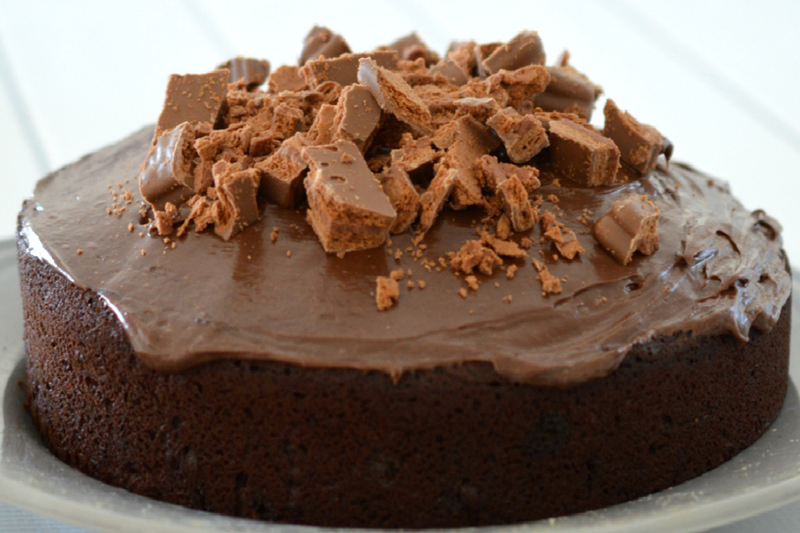 If you are searching for the ultimate indulgent cake, then look no further than this one bowl Tim Tam chocolate cake! This cake really is perfect for all the chocoholics out there and makes a great celebration cake or dessert. Best of all, it only takes a little effort to put together. You just need one bowl to make this cake, which makes it ideal for the kids to help make. Once it has completely cooled, you can top it with a yummy chocolate icing (or if you are short on time, you can also use a store-bought chocolate frosting) and decorate it with MORE Tim Tams, because you can never have enough Tim Tams, right?! When testing to see if this cake is cooked, you want it to still be a little moist (not liquid though!) in the centre as the gooeyness combined with the chunks of Tim Tam throughout are what makes this cake all the more amazing. You will need a full 200g pack of Tim Tam biscuits for this recipe it’s really a challenge to stop yourself from sneaking a biscuit or two while making this cake, so I suggest buying an extra pack just for you! 1. Preheat your oven to 160°c and line the base and sides of a 22cm round cake tin with baking paper. 2. Chop the butter into 8 pieces and place into a microwave-safe bowl. Cook for 1 minute on medium heat or until melted. Set aside to cool slightly. 3. Sift the cocoa and self-raising flour into a large bowl and add the caster sugar, eggs, milk, Tim Tam pieces and melted butter. Mix to combine. 4. Pour the mixture into the prepared cake tin and place in the oven to bake for 40 minutes or until cooked when a skewer inserted into the centre of the cakes comes out with a few moist crumbs. 5. Allow the cake to cool in the tin for 15 minutes before carefully turning out onto a wire cooling rack. 6. Once the cake has cooled completely, you can make the chocolate icing. Sift the cocoa and icing sugar together in a bowl. 7. Add the softened butter and pour the boiling water directly over the butter. 8. Use a small whisk, combine all of the ingredients until the chocolate icing is smooth and is a spreadable consistency. If you find your icing is still a little firm, add an extra teaspoon of boiling water. 9. Use a large spoon to scoop the icing and place onto your cooled cake. Spread the icing out using a spatula or butter knife until the cake is covered. Roughly chop the remaining 5 Tim Tams and place on top of the cake to decorate. You will need one 200g packet of Tim Tams for this recipe.